f71v, Aries dark, Voynich Manuscript. Credit: Beinecke Rare Book and Manuscript Library, Yale University. f71v, Aries light. Voynich Manuscript. Credit: Beinecke Rare Book and Manuscript Library, Yale University. There are five nymphs which face the wrong way, most nymphs face clockwise and this may generally represent the Ecliptic with those nymphs which face anticlockwise representing the retrograde motion of the planets. 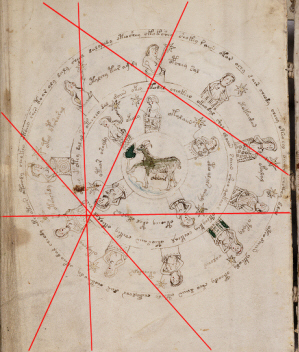 These nymphs would on this folio represent the five naked eye planets Mercury, Venus, Mars, Jupiter and Saturn and be describing their unique property of exhibiting retrograde motion. The Sun and the Moon were originally treated like planets as they also appeared to travel through the sky and may be represented as nymphs also. 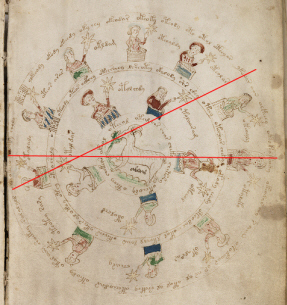 I suggest the Vernal Equinox is contained within the first Aries folio and explicitly depicted as such by the barrels at 3 O’clock depicting the stars and night, and at 9 O’clock depicting the sun (nymph also has solar symbol on her headdress and this is the position of the sun during the day at this time), being equal but opposite and later suggest that this corresponds to the Vernal and Autumnal Equinoxes on a star map on the evening of the Vernal Equinox. 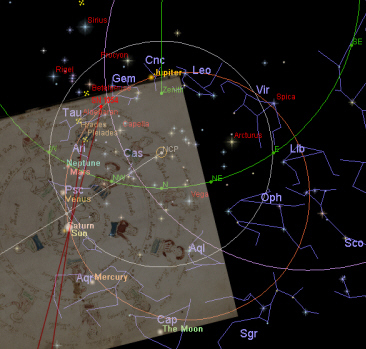 When compared to a star map of the day of the Vernal Equinox on a Mirror image (coding device?) 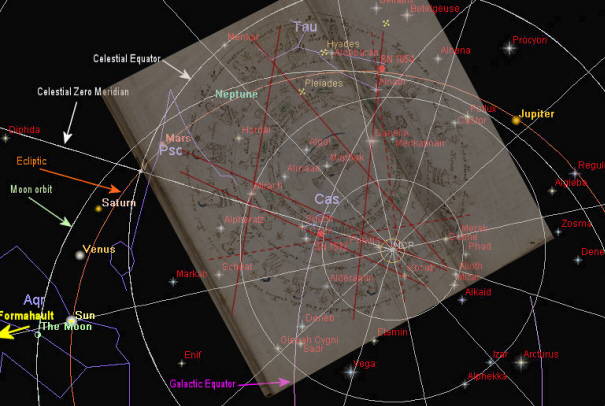 North Pole based Chinese star map certain similarities become apparent. Rotating the folio around to match the star map in terms of the Celestial Zero Meridian and the Equinoxes it can be seen that only two planets are visible in the evening sky Jupiter and Mars, Venus has just set below the horizon and Saturn and Mercury are below the Sun. However, this particular aspect matches a sky down to earth view rather than the usual earth up to sky view and this may be a deliberate twist, designed to hide information and indicated by the planets all being shown in retrograde motion. The specific indication of planets may help in interpreting the differences in the barrel designs, Jupiter and Mars fully visible in the sky, Jupiter in Cancer and Mars in Aries and have patterned barrels, Venus has no pattern but a dashed line which may represent its visibility only as an evening star, Mercury has no pattern at all maybe representing its visibility as a morning star. Saturn is in the correct position but shown with a patterned barrel, this may be something to do with its position in conjunction with the sun, Saturn approaches the Sun last being visible at dusk like Venus, when it becomes visible in the night sky again it is at the boundary of Pisces, and the patterns on the barrels may be representing constellations. The other nymphs may represent stars in particular constellations or at dawn/dusk, e.g., the clockwise facing nymph in the inner circle with the dashed line barrel may represent Arcturus rising in the evening sky as Venus sets. 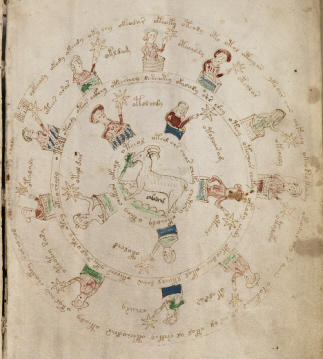 The nymphs being shown in circles in all the zodiac folios are unlikely show accurate positions, but give a general picture of what is going on in the sky of significance during the month or on a particular day. Jupiter unlike all the other nymphs in this folio holds his star behind him, I suggest this star with unusual stripped, thick string shows the position of the supernova SN 1054 between Jupiter and Mars at the Vernal Equinox in a very general way. f71v, Aries dark, Voynich Manuscript. Credit: Beinecke Rare Book and Manuscript Library, Yale University. 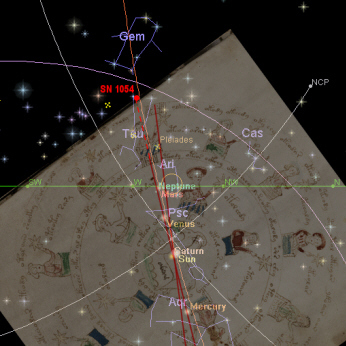 Overlay by P. Han showing suggested positions of and horizon and Celestial Zero Meridian/Ecliptic Zero Meridian at the Vernal Equinox, 1054 AD. Credit: Redshift6. 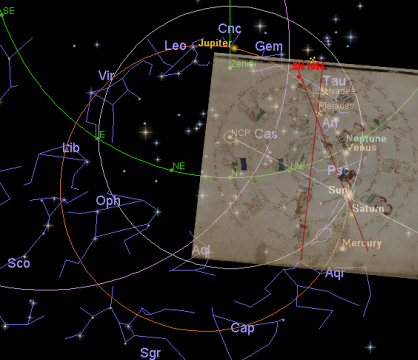 Mirror image North Pole centred star map, 15/3/1054 AD, North China. Vernal Equinox. Working on the assumption that the nymphs showing retrograde motion are planets and in correct order for dusk on the Vernal Equinox some further deductions can be attempted. Venus seen at dusk and Mercury seen at dawn have specific barrel patterns shared by a number of other nymphs, I suggest the nymphs in these other barrels specifically show celestial objects critical to dawn and dusk, e.g., the first and last visible stars. The Suns representing the Vernal Equinox, day with Sun on barrel and night with stars on barrel are self explanatory, but the naked nymph representing the day Sun and clothed representing the night Sun suggest clothing may suggest lack of visibility, e.g. below the horizon/near the Sun or near the horizon. The two nymphs suggested to represent Jupiter and Mars both fully visible in the night sky are shown without clothes and the nymph suggested to represent Saturn, both below the horizon and next to the Sun (conjunction) is shown with clothes, as are Mercury and Venus only visible at dawn and dusk respectively, reinforcing this interpretation. Apart from the ordered planets the stars suggested appear to not be in spatial order but representatives of first, last and bright stars through the night, some even may be bright stars below the horizon. Suggestions for the brightest stars at dawn are Vega and Arcturus and at dusk Sirius and Canopus. The nymphs with question marks may be bright stars below the horizon (as are the Sun and Saturn). The barrels with patterns may represent constellations which the planets or stars are located (except those critical to dawn and dusk). 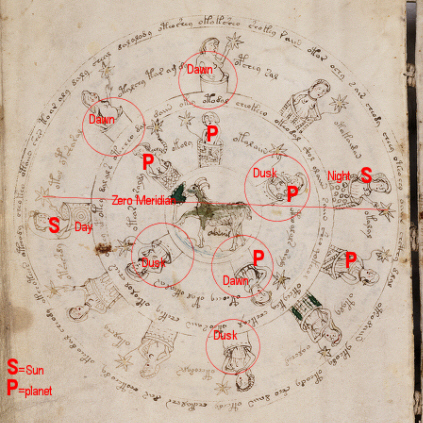 Given the nature of the day in question, the Vernal Equinox, the folio may depict data from dawn, dusk, day and night together making it difficult to follow what is actually being shown. A summary of these suggestions are shown on the images below. f71v, Aries dark, Voynich Manuscript. Credit: Beinecke Rare Book and Manuscript Library, Yale University. Overlay by P. Han showing suggested identifications of the barrels. f71v, Aries dark, Voynich Manuscript. Credit: Beinecke Rare Book and Manuscript Library, Yale University. Overlay by P. Han showing suggested identifications of the planets at the vernal Equinox after sunset, 1054 AD and some other celestial bodies and the constellations they are located in. As has been suggested elsewhere the markers on a folio provide detailed information as was demonstrated in my discussion on the Pisces folio but here there are no markers, is the folio showing a very general overview or is there another type of marker not yet uncovered? One of the things about the Zodiac pages that has intrigued researchers is the bizarre posturing of the nymphs, which has been likened to the figures seen on the centre circle of the "Helios miniature" or classical statues. I have been wondering if they are in fact markers also or at least in some cases. On this folio most hands are firmly in the barrels but a few are held up high the forearms forming straight lines, to explore this further I have made an overlay of these lines and placed it over the star map in a away that could make sense, i.e., including the Vernal Equinox, SN 1054 and SN 1572.
f71v, Aries dark, Voynich Manuscript. Credit: Beinecke Rare Book and Manuscript Library, Yale University. Overlay by P. Han showing folio arm markers. Credit: Redshift6. 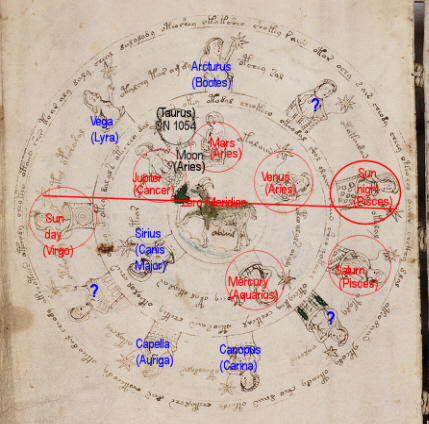 North Pole centred star map (true sky colour), 15/3/1054 AD, North China/f71v, Aries dark, Voynich Manuscript. Credit: Beinecke Rare Book and Manuscript Library, Yale University. Overlay by P. Han showing folio arm markers. Overlay by P. Han showing comparison of folio arm markers to positions of the Sun and SN 1054 at the Vernal Equinox. Intriguingly a position can be found that marks the Vernal and Autumnal Equinoxes, North, West to the Sun, Jupiter, SN 1054 and SN 1572 centring around the NCP. Also, by design or coincidence, the line marking SN 1054 extends down to SN 1604 and the line marking Jupiter extends down to the general area of SN 5 BC. The ram appears to be looking and pointing to the area occupied by SN 1572. With reference to the eyes as markers, three nymphs and the ram appear to be looking at a specific area along with this the ram’s hoof is also pointing to this area. Another nymph appears to be looking at her star. Some of the other nymphs may be looking at stars or planets, or into the distance indicating they are not markers like arms in barrels. 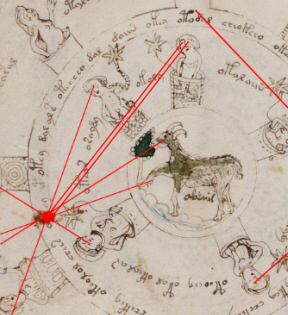 When the central figure is matched up with the constellation Aries which looks back across its shoulder at Taurus all eyes (and hoof) may be pointing to SN 1054. Examples are given below for the days of the Vernal Equinox and Saturn at conjunction, on the day of the Vernal Equinox keeping the mirror image map in relation to the barrels as above, the other eye markers match up with the VE and north also. f71v, cropped, Aries dark, Voynich Manuscript. Credit: Beinecke Rare Book and Manuscript Library, Yale University. Overlay by P. Han showing folio eye markers and central figure eye and hoof markers. Credit: Redshift6. Mirror image North Pole centred star map, 15/3/1054 AD, North China. Vernal Equinox/f71v, cropped, Aries dark, Voynich Manuscript. Credit: Beinecke Rare Book and Manuscript Library, Yale University. Overlay by P. Han showing folio eye markers and central figure eye and hoof markers. Credit: Redshift6. 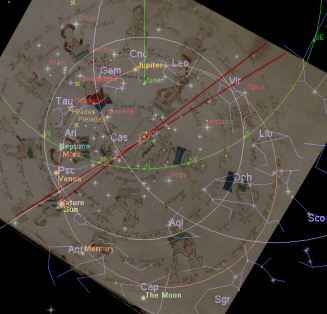 North Pole centred star map, 7/3/1054 AD, North China. Saturn at conjunction/f71v, cropped, Aries dark, Voynich Manuscript. Credit: Beinecke Rare Book and Manuscript Library, Yale University. Overlay by P. Han showing folio eye markers and central figure eye and hoof markers. Following on from this interpretation the Pisces folio has been investigated further. The images below show the markers, the markers located on the star map in a way that makes sense and two horizon views favouring SN 1572 or SN 1054. The upper fish on the central part of the folio is looking at SN 1054 and the lower fish down to the horizon in the west still in this view. f70r, Pisces, Voynich Manuscript. Credit: Beinecke Rare Book and Manuscript Library, Yale University. Overlay by P. Han showing folio arm markers. Credit: Redshift6. 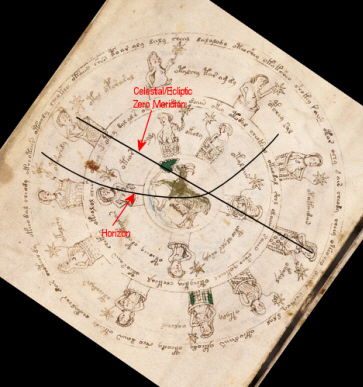 North Pole centred star map (true sky colour), 10/2/1054 AD, North China/f71v, Pisces, Voynich Manuscript. Credit: Beinecke Rare Book and Manuscript Library, Yale University. Overlay by P. Han showing folio arm markers. Another consideration of this hypothesis is how it would relate, if at all, to transference onto a European horizon based star map. Two examples are shown below one map centred on SN 1572 and the other on SN 1054.
Credit: Redshift6. European horizon based star map, 10/2/1054 AD, North China/f71v, Pisces, Voynich Manuscript. Credit: Beinecke Rare Book and Manuscript Library, Yale University. Overlay by P. Han showing folio arm markers centred on SN 1572. Credit: Redshift6. 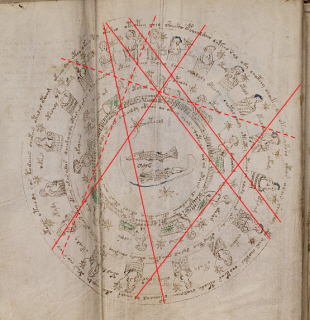 European horizon based star map, 10/2/1054 AD, North China/f71v, Pisces, Voynich Manuscript. Credit: Beinecke Rare Book and Manuscript Library, Yale University. 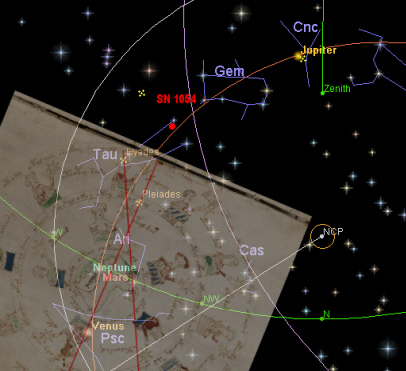 Overlay by P. Han showing folio arm markers centred on SN 1054. The Aries light folio is distinctly different in that the ram lacks the addition of colour and the green of the tree is lighter. The number of nymphs is the same as on the Aries dark folio but the colouring on the barrels and nymphs clothing is becoming more prominent and only one nymph remains unclothed and it shows markers lacking on the Aries dark folio. 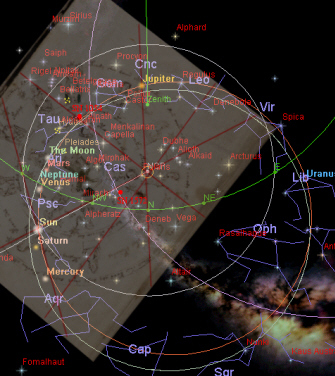 The only events of significance for the month are Saturn at conjunction and the Vernal Equinox and so the markers would probably relate to a star map on one of these days, some examples are given below of how the markers may relate to these days. 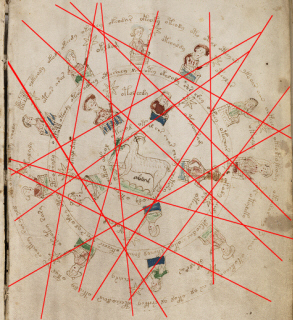 f71v, Aries light, Voynich Manuscript. Credit: Beinecke Rare Book and Manuscript Library, Yale University. f71v, Aries light, Voynich Manuscript. Credit: Beinecke Rare Book and Manuscript Library, Yale University. Overlay by P. Han showing folio markers. 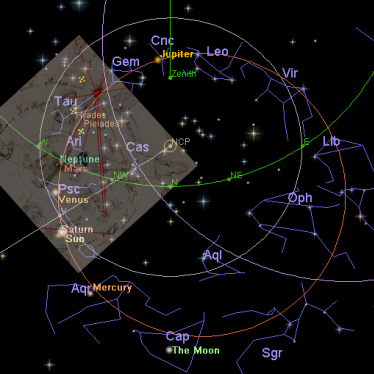 The star map for the Vernal Equinox has been kept with Venus just below the horizon as in Aries Dark and a mirror image. What comes to the attention for these various permutations, whether the Vernal Equinox or Saturn at conjunction, NCP centred or horizon based, is that the Pleiades seems to be a factor which as a logical topic for spring and thus for the folio is a consideration. The Pleiades stop rising just after sunset around the 20th April in 1054 AD which may correlate to the disappearance of the upright barrels in Taurus (April), the upright barrels in the folios marking the time from the lunar new year to the setting of the Pleiades. Like the Aries dark folio some of the nymphs arms are raised and I have shown these as markers in the image below. Given the number of lines it would take a lot of investigation to determine if this web fitted the sky map in any meaningful way. The other zodiac folios have twice as many nymphs with arms and feet in much more complex positions, this technique could be applied to all the folios but untangling their significance would not be a task to be undertaken lightly. Likewise, eyes may also be considered to be markers. f71v, Aries light, Voynich Manuscript. Credit: Beinecke Rare Book and Manuscript Library, Yale University. Overlay by P. Han showing folio arm markers. With reference to the eyes as markers, the nymphs appear to all have their eyes averted away from the middle but the ram as before has its leg pointing and assuming its eyes are markers, this matches the central ram figure looking at SN 1054 through the Pleiades and at the Hyades. 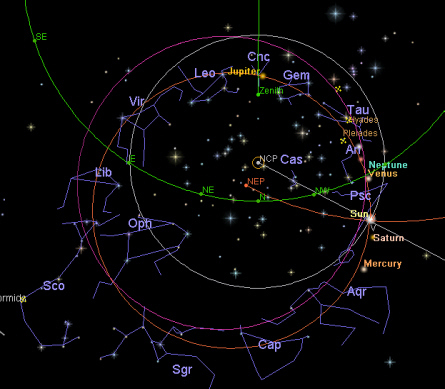 When the central figure is matched up with the constellation Aries which looks back across its shoulder at Taurus, both at the conjunction of Saturn and the Vernal Equinox. f71v, Aries light, Voynich Manuscript. Credit: Beinecke Rare Book and Manuscript Library, Yale University. Overlay by P. Han showing central figure eye and hoof markers. Credit: Redshift6. 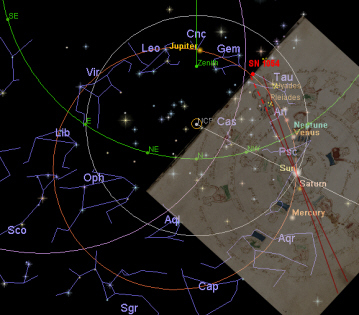 North Pole centred star map 7/3/1054 AD, North China. Saturn at conjunction/f71v, Aries light, Voynich Manuscript. Credit: Beinecke Rare Book and Manuscript Library, Yale University. Overlay by P. Han showing central figure eye and hoof markers. 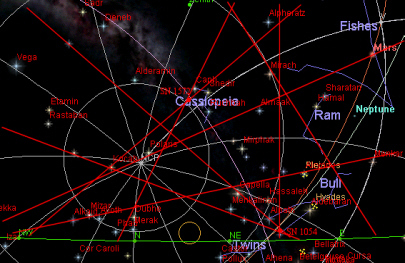 The ram is pointing to SN 1054s and looking at the Hyades, the Pleiades being marked by both. Credit: Redshift6. 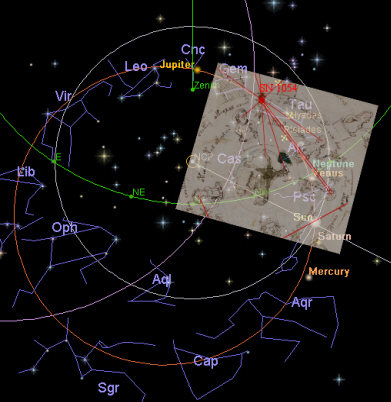 Mirror image North Pole centred star map 15/3/1054 AD, North China. 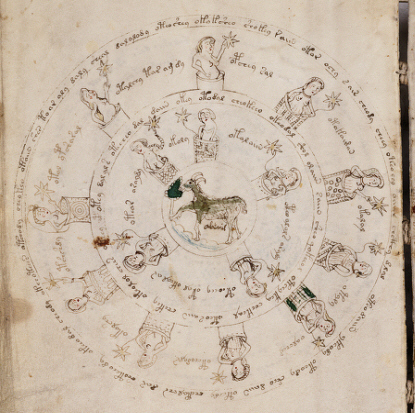 Vernal Equinox/f71v, Aries light, Voynich Manuscript. Credit: Beinecke Rare Book and Manuscript Library, Yale University. Overlay by P. Han showing central figure eye and hoof markers. The ram is pointing to the Hyades and looking at SN 1054, the Pleiades being marked by both. The only notable event the second half of March is the occultation of Hyades by the moon, not an uncommon occurrence. However, it may be showing the cycle of the planet Saturn in more detail rather than any date specific event. Many of the figures on this folio are shown wearing a brimmed hat in various upturned positions, this may demonstrate the rings of Saturn and their changing orientation as seen from earth.